Lots of folks here in Yellowknife have great stories about the treasures they’ve found at the dump. When I first moved to town back in oh three, I outfitted a whole apartment with salvaged housewares—couch, toaster, microwave, TV—the whole bit. One of my very first dump scores was a bike that I still use regularly—my winter bike, or truck bike as I like to call it for the big milk crate on the back. This story is about another bike though, an older one, a fixer-upper at best, that I salvaged from the dump in 2010 and refurbished over a couple of months this past fall and winter. My parents were up visiting for their second time, and I thought I’d better take them out to see the dump. After all, I’d raved about it over the years. Also I consider it an important stop for tourists to Yellowknife. The pickings are not what they used to be, though, and we weren’t finding much in the way of salvageable stuff. Not until we were just about to leave, and my dad pointed out a couple of old bikes. “Salvageable” is a subjective term I guess, because these bikes were junk. Somehow, though, I saw beauty in one of them. It was in totally rough shape, but I thought bringing it back to life might make a good project some time down the road. It was an old CCM women’s “Cleveland” model that I guessed was from the 1940s or ‘50s, and the frame looked to be in good shape, as did lots of the other parts on it. I threw it in the truck, against my better judgement, and, in retrospect, I wonder how much it was just to show my parents that you can always find something at the dump. 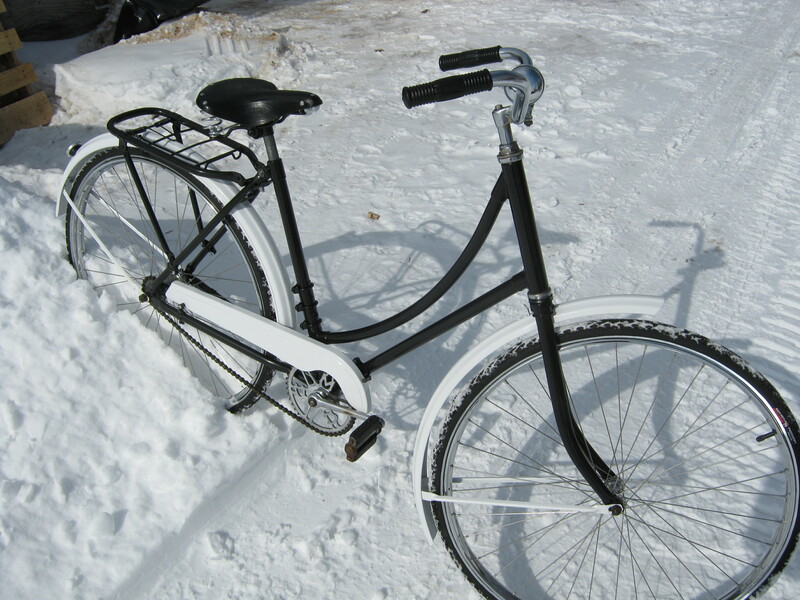 This bike lived in my yard for the next year, buried in the snow in the winter, and collecting weeds through the summer. I didn’t think about it much, but I guess it stayed in the back of my mind. Finally, and tentatively at first, I decided to tackle restoring the bike. I discovered right away that I wouldn’t be restoring it, technically, since I wouldn’t be bringing it back to its original condition. That would be hopeless since it had already been repainted from wine-red to baby blue at some point, and some of the key components (the rims especially) were rusted far beyond repair. It turned out that there was a break in the frame, which delayed me while I made arrangements with my neighbour, a skilled welder, to weld it back together. The stem was rusted in so badly that it took a month to get it out, and even at that I had to cut it, drill it, heat it, twist it, and, trust me, hammer it lots. 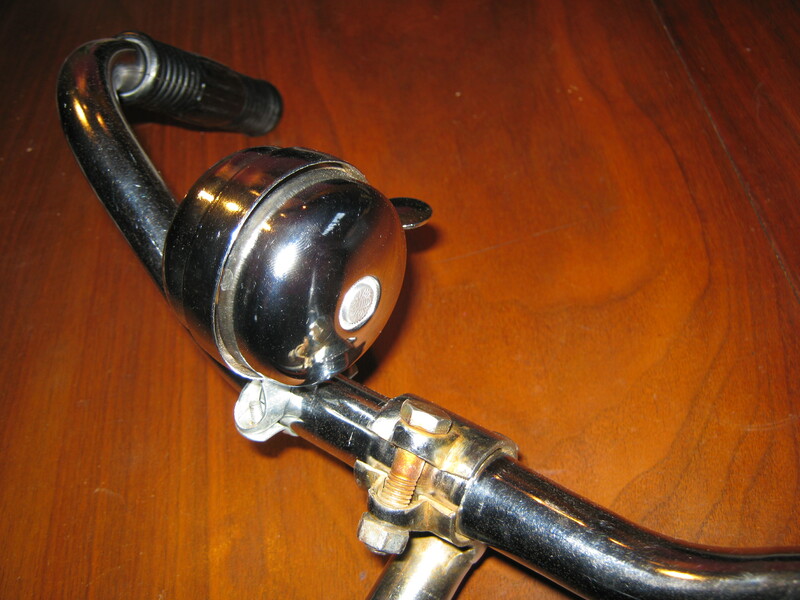 Some of the parts were structurally fine, but rusted, such as the handlebars. It would have been nice to keep the originals, but the goal was to make the bike look as nice as possible. I brought the handlebars to Edmonton in the fall, and tried to find a good match for them there, but with no luck. (I did get a sweet bell, though, which maybe doesn’t match the age of the bike but looks nice, and cost me nothing—the guy at the Bicycle Commuters shop was just happy to get rid of it). When I went to Vancouver a month later, I carried with me a full scale tracing of the bars on paper, and checked a couple bike co-ops, before finally settling on a handlebar that was, well, close enough. Other parts were in amazingly good shape. All the bearings were built to last, and were easy to maintain over the years. Both front and rear hubs, as well as the bottom bracket, have little valves built into them for pouring oil in. The ball bearings themselves were huge, and added to the overall weight of the bike, which is Very Heavy. I spent a few evenings in the winter overhauling these parts of the bike, cleaning out the old grease and grime, and reassembling everything. 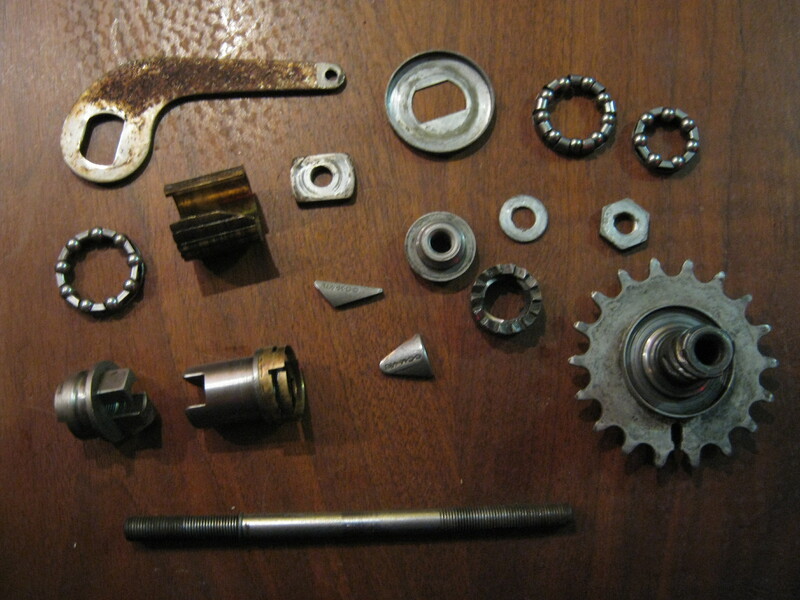 When it came to the rear hub, which is a one speed drive as well as the coaster (pedal) brake, it was a good thing I took a picture of the parts as they came out, because I never would have gotten them back together otherwise. The out-dated “Westwood” style rims were a bit of an adventure. I didn’t expect to find a decent replacement, since I thought they were obsolete. I decided at first I would settle for any steel rim, since aluminum would just look wrong. Shopping for steel rims here in town, I was asked “why would you want that?” I was able, in the end, to find a company that distributes actual Westwood rims in the right size, and back home in Peterborough at Christmas, found a co-op shop called Bike that dealt with the distributor. At Bike, they promised that if I gave them $40 cash (twenty bucks each and no tax since Bike doesn’t make much money), then sometime in January they would place the order, and when the rims came in, their mechanic would take them to his other shop, and quote me some prices to ship them up to Yellowknife from there. Believe it or not this all worked out fine, and some evening later in the winter I re-laced the wheels with new spokes and rims, but the original hubs. 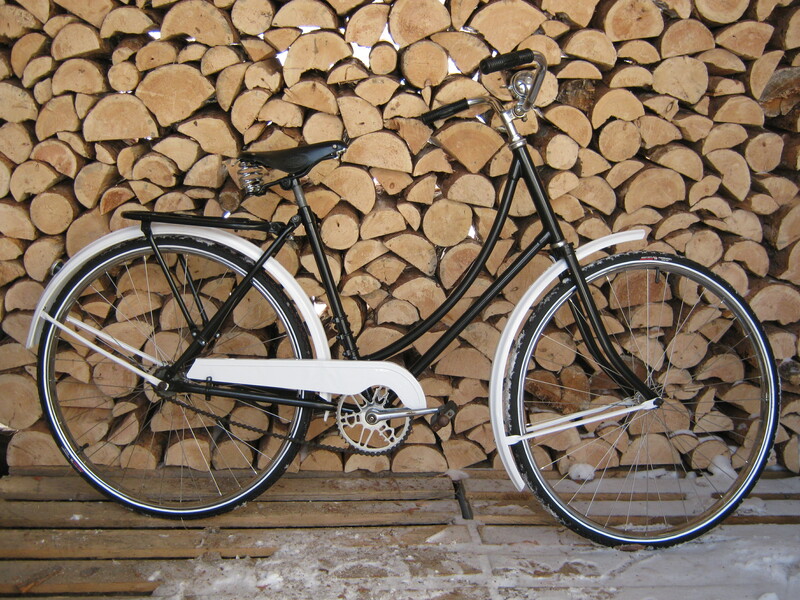 Throughout most of this time, I’d been painting the frame, fork, fenders, chainguard and rack. 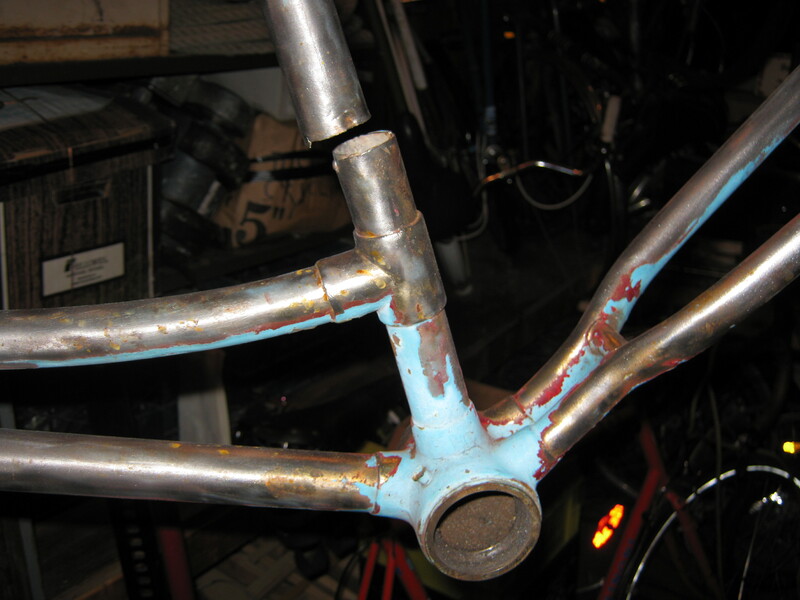 It was in the process of stripping off the old paint that I discovered the serial number on the frame—1D0267. Magic Google allowed me to date the bike to 1940 based on that number. I got a couple coats of primer on some of the parts outdoors before the weather got too cold, but much of the painting was done in my bathroom, which I outfitted with a ventilation fan and lots of plastic sheeting. The ventilation was a little inadequate, so I always painted really fast, and then got out of the house for a while. 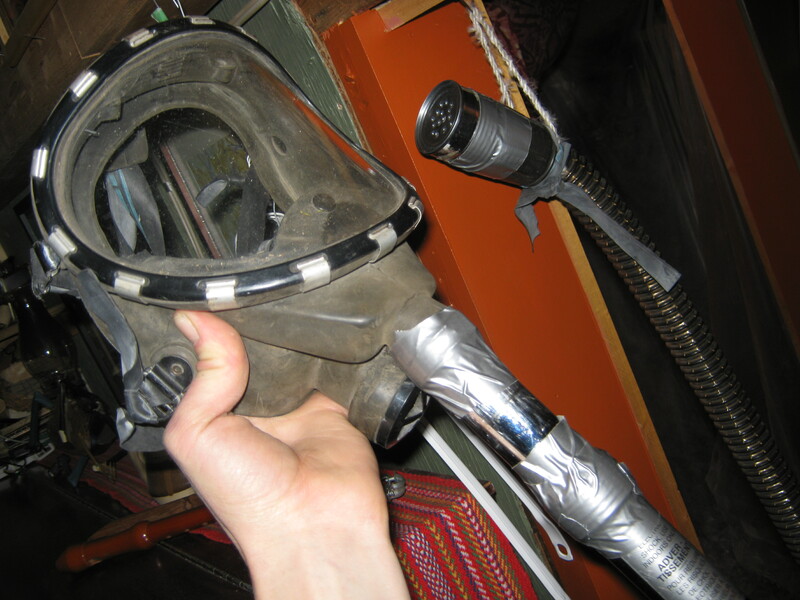 Later on I put together a gas mask that involved a vacuum cleaner hose and some old inner tubes, but I don’t want to go into detail about that. This project pretty much came together around early February, when I got the wheels rebuilt. It was a good time along the way—I’d taken on a whole bunch of little challenges, forced myself to learn some new skills, taken an obsolete piece of junk out of the dump and made it both beautiful and functional again. I used Bondo. Discovered how finicky you have to be to get a decent paint job. All this bike needed was a loving home, and it’s got one now, since it got put up for sale at the annual Ecology North silent auction, and sold to the highest bidder. Can’t wait to see this old CCM enjoying its second round cruising the streets of Yellowknife. This entry was posted in Projects, Reading. Bookmark the permalink.